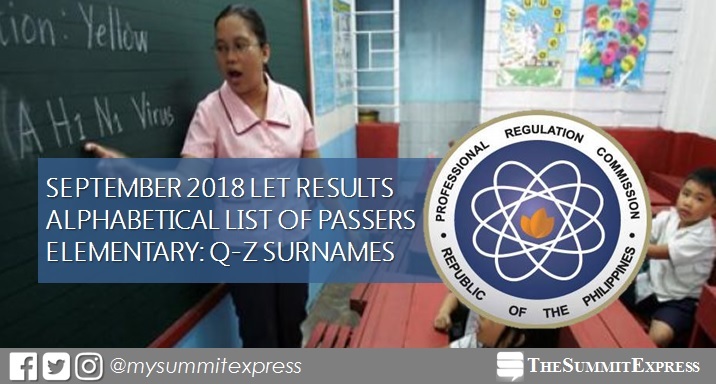 MANILA, Philippines – Those awaiting results of September 2018 Licensure Examination for Teachers (LET) may check on this page the alphabetical list of passers (Q-Z surnames) as the Professional Regulation Commission (PRC) and the Board of Professional Teacher (BPT) released results on Friday, December 7 or in 47 working days after the exam. The teacher licensure exam was administered by BPT composed of Dr. Rosita L. Navarro, Chairman; Dr. Paz I. Lucido, Vice Chairman; Dr. Paraluman R. Giron and Dr. Nora M. Uy, Members, on September 30, 2018 in at least 25 testing centers nationwide. Takers may now view on this page the alphabetical roll of passers for Q to Z Surnames (Elementary Level). PRC said that passing the LET and having valid professional license are necessary before the practice of teaching profession in the Philippines. Otherwise, those who will violate may face fine and imprisonment based on penal provisions.